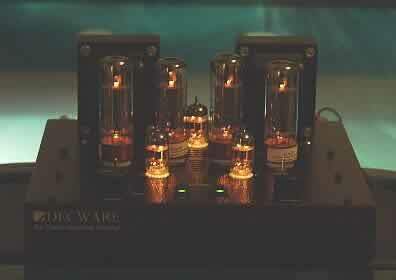 Do you savor the sweet and sultry sound of a directly-heated, single-ended triode like a 2A3? Perhaps you prefer the incredible speed, accuracy, and detail found in the best single-ended pseudo-triode amps, like those using the SV83 tube. Maybe, 1.5 to 3 watts per channel isn't enough, and you long for more potent output from a 300B amplifier. Perhaps you prefer to compromise: decent power with very good detail. Or, maybe you want them all, but you can't afford several amps or sets of monoblocs. In the last few years, tube amplifiers have become more common, more affordable, and more versatile than at any time in recent memory. Steve Deckert is the founder and chief engineer of High Fidelity Engineering, better known as Decware. As such, he is primarily responsible for Decware's somewhat eccentric, high fidelity-oriented, audio products. Decware is known for producing amplifiers and preamps based on very inexpensive and easily obtainable tubes, very simple circuits, and assembled from high quality components. Their first, and most popular product, the SE84 Zen Triode, is a prime example. The current version of this little amplifier, the SE84C, uses the 5Y3GT rectifier, SV83 pentode, and 6N1P dual-triode tubes. It has been lauded by most who have heard it. While it has very low power output, its low price combined with tremendous speed and detail have made it a favorite of many audio enthusiasts who cannot afford, or simply choose not to spend thousands of dollars on esoteric equipment with prestigious brand names. Not surprisingly, the most vocal critics of the little Zen amp have been other manufacturers, although there are a few that now make products with similar designs. Decware builds two different preamps and several models of stereo and monobloc power amplifiers based on the Zen circuit. 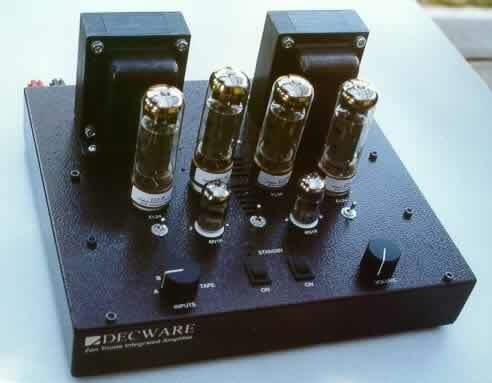 Missing from Decware's lineup was an integrated amplifier. Enter: the SE34-I, a stereo, integrated amplifier that combines basic circuit designs of Decware's ZTPre preamplifier and the Zen Triode power amp, but with a major difference: instead of using Decware's ubiquitous SV83 output tube, the SE34-I uses EL34 pentodes. The SE34-I is an integrated, stereo amplifier that uses three 6N1P dual-triode tubes, one for the preamp circuit, two as driver tubes, and four EL34 pentode output tubes wired in triode mode. The unit is built into a metallic brown, powder-coated, steel chassis. Two large power transformers are located on top of the chassis near the back edge. As with all Decware power amplifiers, the output transformers are inside in the front portion of the unit. All of the tubes are located on top of the chassis in front of the power transformers. From the custom-wound transformers to the resistors and the Alps volume pot, high quality parts are used throughout. 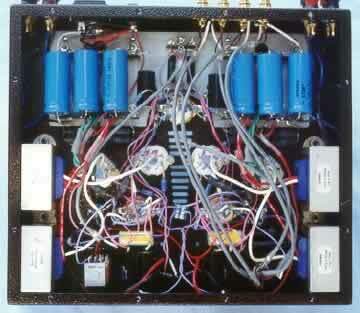 All wiring is point-to-point; there are no circuit boards in this amp. Nearly all the controls are placed on the top of the chassis. Two toggle switches next to the driver tubes change the circuit voltage between the preamp and each of the driver tubes. A third toggle, which is centered between the driver tubes, changes the output tube bias. The two rocker switches, located at the front edge of the unit, are stand-by switches. The right knob controls the volume, while the left knob is the input selector. The main power switch is located on the back of the unit, along with four pairs of gold-plated, RCA input jacks. There are four speaker binding posts per channel. Options include preamp and tape output jacks, which were not included on the test unit. The design of this integrated stereo amplifier is unique. The integrated preamp is a dual-mono unit that uses a circuit similar to Decware's ZTPre. However, the gain stage shares one tube for both channels, and, of course, it is not isolated within a vibration-damping sub-chassis, as is the ZTPre. 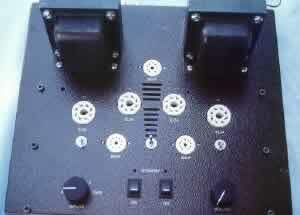 There are four line-level inputs, but no phono stage. Instead of utilizing a single, stereo power amplifier as is commonly done with integrated amplifiers, the SE34-I combines two mono power amps into one chassis, hence the dual power transformers. Each power amplifier uses a pair of EL34 output tubes, but they are connected in a very unusual manner. While the layout looks like a push-pull arrangement, with one driver tube and two output tubes per channel, in fact, the topology is single-ended with two tubes per channel operating in parallel or in series, depending on the user's choice. Since there are four output transformers, two for each side, the SE34-I may be operated with only one output tube per channel. 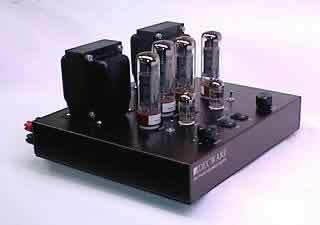 In addition, since the EL34 tube can be wired as a pseudo-triode or a true-triode, Steve has done both - the inside pair of tubes are wired for true triode, and the outside pair of tubes are wired for pseudo-triode. Each tube has its own pair of binding posts. As such, if the two inside tubes are removed and the speaker cables are attached to the two outside binding posts, the amplifier operates in pseudo-triode mode at about 3.4 watts per channel. Conversely, if the two outside tubes are removed and the speaker cables are connected to the two inside binding posts, the amplifier operates in true-triode mode at about the same power output. When using two tubes per channel and wired in parallel, the SE34-I produces about 7 wpc. Series wiring produces less power than parallel, but still more than single-tube operation. Another aspect of the quad speaker binding posts per channel is that a user has the option to run two speakers with single cables, two speakers with bi-wiring, or four speakers - all two channel, of course. The SE34-I was tested with four sources including a nOrh CD-1, tube-output CD-player, a Pioneer DV-525 DVD player with a slightly modified ART DI/O DAC, and a Dynavector DV20X and Benz Micro Gold phono cartridges using Creek Audio OBH-8 and OBH-9SE phono preamps. The speakers included Moth Audio Cicada (single-driver, bass-reflex, 94dB), Hornshoppe Horns (single-driver, horn-loaded, 94dB), and nOrh SM 6.9 (2-way, bass-reflex, with a synthetic marble, inverted horn cabinet, 88dB). As a final experiment, a pair of B&W DM602 speakers, which are a 2-way, bass-reflex design, were bi-wired allowing separate output tubes and transformers to drive the tweeters and woofers. "How does it sound?" This is a difficult question to answer with this amplifier because it can sound very different one minute to the next depending on what adjustment has been made. The short answer is that it can be a very fast, accurate, and detailed amplifier with sufficient power to operate moderately efficient speakers, or, it can can be smooth, laid back, and almost lush-sounding. The SE34-I has great flexibility because of its adjustability. While evaluating the SE34-I, it was easy to draw parallels between it and the Decware Zen Triode SE84C amplifier. While there are many differences between these two amplifiers, there are basic similarities in circuit and design philosophy. As part of the evaluation, performance comparisons were made between the SE34-I and a Decware preamp/amp combination: a ZTPre preamp and a Zen Triode SE84C Select stereo amplifier (the Select version of the SE84C is somewhat altered with superior components and slightly different tube selection). The single greatest strength of the SE34-I is its adjustability. This gives it the versatility to allow the user to tailor the amplifier to sources and speakers separately or in combination. In addition to the ability to improve synergy between the SE34-I and other components, the listener may simply "tune" the amp to suit the recording, the type of music being played, or their current mood. In 'true triode' mode, the SE34-I is clear, sweet, and natural sounding. In this mode, it is ideal for vocals, acoustical instruments, and cool jazz. The liquid-smooth highs contribute to a sound that is somewhat laid back and not very aggressive. In particular, singers with a smooth, melodic vocal style, like Jacintha or John Gary, benefit greatly from this mode. Detail is very good. However, some detail seems to be smoothed out in the presentation. The soundstage is fairly wide and reasonably deep. Instruments can be located in space, but image precision is only fair. In pseudo-triode mode, the amp sounds more forward, faster, more detailed, and more aggressive. In fact, pseudo-triode mode most resembles the sound output signature of Decware's other power amplifiers. Some vocals don't sound as smooth or quite as appealing; they take on a sharper edge that may not complement their style quite as well as true-triode mode. However, this quality works very well with many vocals, such as Peter Gabriel or smoky jazz like Patricia Barber. Holographic imaging is very good in this mode, allowing the listener to precisely locate instruments in space. There is noticeably more air around the instruments. Rock music and hot jazz are better served by the pseudo-triode setting, allowing their more aggressive nature to really shine. Using all four output tubes in parallel mode, the SE34-I has much more power and is able to deliver sufficient headroom, with reasonable speakers, to play music with a wide dynamic range. However, detail seems slightly smoothed over, somewhat veiled. Additionally, stereo imaging in this mode is only fair. When the SE34-I is wired in series, it seems to have significantly better power than single-tube operation, though not as much as in parallel mode. However, it also seems to balance the smoother presentation of true-triode with superior imaging of pseudo-triode modes. On average, series connection ended up being my favorite, as it worked very well for most types of music including classical. Of course, these observations are relevant only with the setup I was using at the time. The SE34-I displays one characteristic for which the Decware Zen Amp is renowned - it is very fast, with great timing, accuracy, and detail. Although very close, the SE34-I still cannot quite match the extraordinary detail and holographic imaging of the SE84C-S. But then, not many amplifiers can. On the other hand, the SE34-I has much more power and is able to drive more difficult loads then the Zen Triode. When driving a pair of Moth Audio Cicadas, the SE34-I sounded wonderful. The output was honest, clean, and very musical. Even in single-tube mode, the SE34-I drove the Cicadas without difficulty. The SE84C-S, either singly or using two of them as monoblocs, was incapable of driving the Cicadas; the 12-ohm load was too much for the little Zens. When using a pair of nOrh SM6.9 drums, which have a rated sensitivity of 88dB/1w/1M and a rather complex, power-dissipating crossover network, the SE84C-S was too feeble to use by itself. Using a pair of Zens as monoblocs produced beautiful, clean, musical sound, provided the volume was kept very low. At listening levels approaching normal, the Zens simply could not produce enough power. However, the SE34-I worked well with the nOrh loudspeakers, producing volume levels substantially higher than comfortable. Clipping could be induced, but the volume had to be higher than acceptable in my listening room. When played at reasonable volume (around 86dB), the SE34-I had sufficient headroom to allow the nOrh loudspeakers to really sing. When driving the SM6.9s, the Decware Integrated amp sounded wonderful at all frequencies; it even produced powerful bass at least down to the speakers rated limit of 40Hz. The 40Hz synthesizer tone from Magic Man ("Heart", Nautilus LP) was more visceral and powerful than a recent test with a 110wpc solid state power amp. In fact, when the bias switch was changed to the forward position, bass from the nOrh speakers was simply overpowering; the SE34-I seemed unable to control bass adequately on the SM6.9s with the switch in the more aggressive position. When the bias switch was used with the Horns or the B&Ws, the bass was deep, fast, and much more potent; bass was well controlled regardless of the switch position. While the SE34-I could be used with satisfaction with the SM6.9s, they clearly would not be a first choice. The SE34-I drove the B&W DM602 loudspeakers without difficulty, producing clear, detailed output. However, when the B&Ws were bi-wired with the true-triode signal driving the tweeters and the pseudo-triode signal driving the woofers, the sound was surprising. The DM602s seemed to be transformed. These humble, commercially produced speakers can sound surprisingly rich, amazingly detailed, and, after sufficient breakin time (4 years and counting), very musical. Holographic, stereo imaging with the SE34-I is quite good. Decent recordings allow instrument and singer locations to be easily discerned. When playing the 'Peace Pipes' LP by Arco Iris, using the Benz Micro and OBH-9SE, each instrument was well defined in a three-dimensional soundstage. This was observed with other recordings as well. While holographic imaging of the SE34-I does not quite reach the level of illusion attained by the ZTPre and SE84C Select combination, it is still very impressive. The SE34-I is a purist design with no tone controls. While this may seem a deficiency to some, it is done in the interest of maintaining as clean a signal path as possible. However, despite the lack of tone controls, spectral balance and other aspects of output sound can be adjusted. Two toggle switches are located adjacent to the outside edge of the driver tubes. These switches change the voltage between the preamp and driver stage. This allows the user to attempt to achieve a better synergistic match between the SE34-I and different sources. After playing with different sources it is clear that there is no best position for these switches. 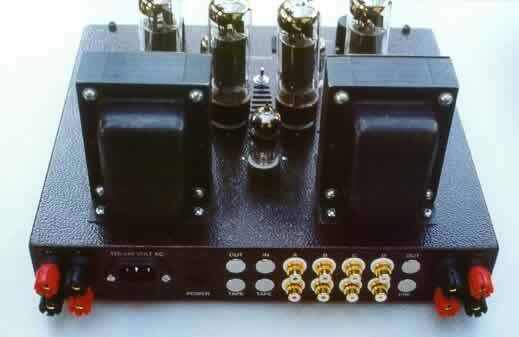 For example, a nOrh CD-1, with Amperex 5751 output tubes, sounded best with the switches in one position, but an Art DI/O DAC (used with a Pioneer DV525 DVD-player as a transport) preferred the switches set in the other position. The switches can be adjusted in real time - there is no need to shut off the power to make the voltage change. If voltage adjustment to improve synergy between the SE34-I and sources is not enough, there is still the "magic switch." The third toggle switch on top of the amp is located between the two driver tubes. This switch changes the tube bias, again in real time. The resulting tonal balance change is not subtle, it is huge. With the switch in the rearward position, the sound is very clean, very neutral. Detail is at its best and music sounds natural. However, sometimes the listener has a need for more impact, more bass, and stronger highs. Changing the switch to the forward position results in just that. This switch works more realistically than any tone controls I have heard recently. Bass takes on so much power, depth, and sheer impact, it doesn't even sound like the same amplifier. Highs are more brash and potent. Is the music better with the switch in this position? Yes, and no. That depends on the speakers in use, the music being played, and the mood of the listener. This amplifier is very well built and carries a lifetime warranty to the original purchaser. Ergonomically, the SE34-I is one of the easiest to use of any Decware products with which I have worked - with one notable exception, speaker cable hookup, which I will return to in the next section. The standby switches and the two major controls, input selector and volume, are located on top near the front of the chassis. The visual aesthetics of this amplifier are not fancy, but are simple and attractive. This is a nicely designed and well-finished product, but it does not qualify for the status of audio jewelry. While the SE34-I is an attractively designed amplifier in bright light, it looks most impressive in a slightly darkened room with all seven tubes glowing warmly. Last, but not least, the SE34-I has a power-saving feature that allows the unit to stay on and warmed up, without using as much electricity. The standby mode reduces power consumption to 54 watts. While this isn't a huge reduction from the 73 watts the unit consumes, any reduction helps. As a side benefit, the SE34-I does not produce as much heat on standby as it does during normal operation. The main power switch is located on the back of the unit, as is the usual practice with Decware equipment. However, the standby switches are located on the very front of the unit top. When in standby mode, the tubes are lit, but the switches are not. When the standby switches are turned to the 'on' position, they are lit with red, internal lights (the above photo, from the Decware website, shows green). Provided the main switch has been on for a few minutes, the SE34-I produces sound almost immediately after the standby switches are turned on. When the SE34-I is cold-started with the main power switch, it takes 30 seconds or more before any sound issues from it. It is difficult to fault the sound quality of the SE34-I because, if you don't like how it sounds, simply change it until it suits you. While the clarity and detail of this integrated amplifier are excellent, it is not quite as detailed as the ZTPre/Zen Select combination. If the SE34-I is auditioned without direct comparisons, it comes across as a very clean and musical sounding amplifier. Only by making direct comparisons with more detailed amplifiers does this minor shortcoming become apparent. Even while making a direct comparison between a well-broken in SE84C Select/ZTPre combination and the SE34-I, the latter does not suffer badly. There is only slight veiling of detail and minor blurring of holographic imaging compared to the Zen and preamp combo. While the SE34-I has a dual-mono preamp integrated into the design, it has neither separate volume controls for each channel (as does Decware's ZTPre) nor a balance control. While this generally shouldn't be a problem, there are certainly times when some balance adjustment is desireable or necessary. During the test period, the lack of a balance control was never an issue, but in practice, occasionally it may be. Speaker cable hookup can be confusing at first. There are four binding posts per channel. The manual describes the four methods of connecting the cables and which tubes to pull for single-tube operation. I found Initial reading of the instructions to be slightly confusing. All the necessary information was there, but it required careful analysis to understand what was intended by the instructions. I have to assume that if I found the instructions somewhat unclear, there probably is a user somewhere that also will be confused. Perhaps better illustrations in the instructions would help. For the price of the SE34-I, many people will be expecting chrome or brass highlights, or a polished hardwood chassis. They will be disappointed. This amplifier was not designed to appeal to those looking for audio jewelry. However, if a user needs to pay more attention to an amplifier's appearance than to its output quality, there are many other amps in the same price range that will happily sacrifice sound quality for visual aesthetics. There is no protective cage available for this amplifier. While this may not be a problem for most people (indeed, I much prefer running a tube amp without a cage), those with young children or nosy pets must be certain to place the amp where the inquisitive cannot reach. In addition, there are some markets in which sale of a tube amp without a protective cover is not allowed. The SE34-I is a remarkably versatile amplifier that allows the user to tune the output to suit most needs and moods. While the SE34-I can sound like several different amplifiers, the one quality that remains through all the available adjustments is well-detailed, richly musical output. Whether you like your music somewhat brash, edgy, and in-your-face, or you prefer it to be more laid back and silky smooth with incredibly natural mids, the SE34-I delivers. The Decware Integrated is not the best at any one of its "sound signatures," but it does what few others can. That is, it provides four distinct sonic signatures for the price of one. In addition, driver tube voltage and output tube bias can be changed on the fly for additional versatility. The SE34-I is attractively styled, simple, and well-finished, although it is neither fancy nor decked out with chrome or polished acouterments. While not inexpensive, the SE34-I provides excellent value by delivering performance and versatility that is very difficult to match. The Decware Integrated is an amplifier to treasure, not because it is 'the best' at anything it does, but because it does so much, does it so well, and never strays from the idea that musical reproduction is at the heart of its purpose. There are more accurate amplifiers, Decware builds some of them; there are more lush-sounding amps; and there are many more powerful amps. However, the combination of flexibility, musically honest sound, and quality of workmanship is unique. In my collection of amplifiers, I have examples that are vastly more powerful or more lush sounding, and one that is more detailed and more holographic in its output (a Zen Triode). Each serves a different purpose while testing audio equipment. If I didn't need the variety of amps for review purposes and wanted to consolidate and reduce to exactly one amplifier, the Decware SE34-I would suit my needs spendidly. It is a joy to read a review that so accurately gets the point! You were able to exactly describe each possible configuration with dead on accuracy. As I read it, I kept thinking "ya... that's what it's suppose to do,... yup, that's it, he's hearing it exactly the way I do." Conformation is a great thing! I do have a few comments. This was the amplifier I designed to live and be happy in the real world. It has the ability to make a normal CD player listenable. Through its adjustability it can even make sub par recordings fun to listen to yet has suitable resolution and accuracy to thrill any serious audiophile. It will drive most any speaker to at least a normal listening level making it easy to invest in. Ironically, a lot of attention was spent on voicing it for Lowthers and other high efficiency, high impedance single driver speakers and the combination of the two is unusually good! All of the other Zen Triode amplifiers we make do not like high impedance speakers which is what dominate the high end SET cult. I wanted to make sure that we didn't leave these wonderful speakers out this time, and the unforgiving nature of such speakers is nicely complimented by the forgiving nature of the SE34-I. Lastly, about the looks... Again you are dead on target with your description. But a little more insight can't hurt. The finish on the amplifier is an indestructible powder coat wrinkle finish (brown) and was actually more expensive than the more conventional black and chrome approach. I designed the amplifier's physical size and brown color to look artistically balanced in a hardwood base that the amp slips down inside. But we have been so busy soldering that the bases won't be available until this Summer. You will be very impressed when you see the amplifier with the hardwood base. There is also a custom dampening block (black) for it, just like our other amplifiers, and it is available now. Some photographs used in this review courtesy of Decware. Many thanks to Mr. Deckert and everyone else involved for providing the unit used in this review.